Hi all, new Steemit user here. For my first post, an image I made with neural-style, which allows you to transfer the style of one image onto another using a pre-trained neural network (similar to DeepDream). 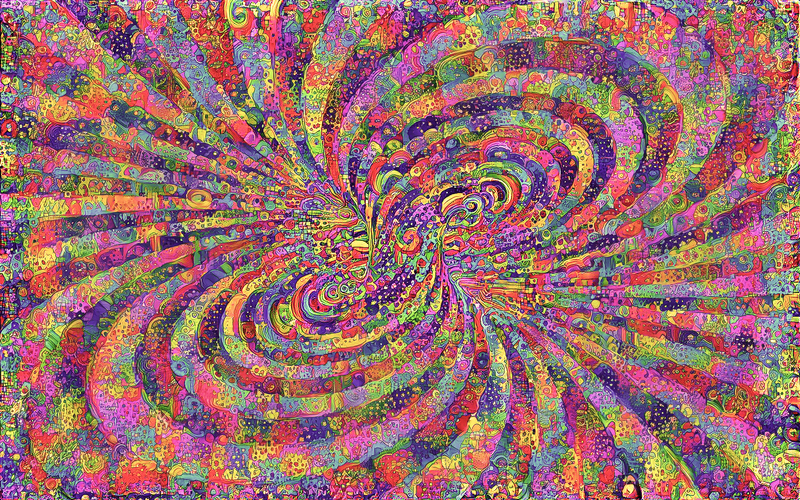 I combined two psychedelic patterns that I came across on Instagram and then used that style to render the spiral, which was plain black and white. I've also tried a video application of this type of software which uses another deep learning algorithm to map the "flow" between each frame of a video file and apply smooth style transfer to that. It takes a hell of a lot of computing power (my GTX 1070 takes about a day to render 15 seconds of video at just under 720p), but the results are interesting. Style transfer can also be applied to 360 video and viewed using a VR headset, the quality is not exactly magnificent at this point but you can definitely see the potential. So far, my experience of using the above software has been a lot of fun, 99% of the images I made while learning how to use it were grotesque, slightly unnverving, or hilariously malformed, nowadays it is closer to 95% so it was definitely worth my time to learn. I'll be posting some of the more interesting things I make, and potentially some low-tech tutorial videos, if I can figure it out well enough to explain. hi @Thomasknow:) Glad to see more people like you - here joining steemit! Becoming a steamian is a great adventure ! Here you can win money while bloging! At the beginning it wouldn't be easy, but it isn't impossible. So just write from your heart and everything will be allright. Wish you much luck! Cheers! Greetings, @khunpoom! Hello @thomasknow. Welcome to Steemit. I am David. I wish you have a happy journey here.